The experience shower, or the rave shower as I like to call it, is the most perfect and desirable frivolous invention in human history. Regular showers are already glorious experiences in which practicality (getting clean) merges beautifully with luxury (your naked body being doused with warm, relaxing water). But in a rave shower, you are inundated with luscious scents and pretty lights and streams of water especially designed to feel like the velvet patter of an especially kindly rain. All I have ever wanted in this life is to be rich enough to own an apartment and rich enough on top of that to have my personal rave shower installed. It is a perfect invention. And yet today, in my Google Alert for “Experience Shower,” a gift was gently dropped into my inbox like so many pennies from heaven that proved to me that yes, you can improve on perfection. I don’t often receive updates for this particular Google Alert because, as you might imagine, the world of the experience shower is relatively niche and therefore slow moving. So when something arrives, I’m eager to lap it up. What I discovered was, at first, so breathtaking to the point of unbelievability: the rave shower has been updated via technology and, somehow, improved. 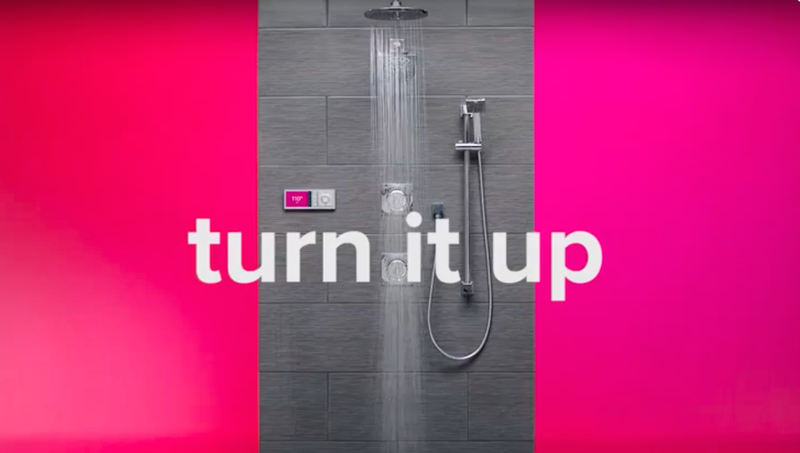 This video has everything, almost like they made it especially for me: a shower, pretty colors, and a Flume-style track to emphasize that it is indeed a new age, wherein we can now use our phones (simply an extension of our brain) to control the music, stream, steam and temperature of our showers. I mean, why turn it on manually, right? That’s dirty. Your delicate fingers should only have to deign to sully themselves on the gleaming crystal of a touch screen. It suggests making a post-workout profile, which really gets me motoring, the idea that I could come home from the gym (or emerge from my home gym, because again in this scenario I am very rich) and press “post-workout” on my telephone and, based on memory from the cloud—oh, the cloud!—the ideal rate of nourishing water would rain down upon me and cleanse away my sweat, while my cooldown playlist—early Janet, classic reggae, definitely that Goapele song “Closer”—would whisk me to a lush state of relaxation, the likes of which I have never felt before. And afterwards, I will step onto my penthouse deck, which I will have surrounded with palm trees to keep my rich neighbors Jay Z and Beyoncé from being able to spy on my habits in our beautiful Tribeca neighborhood, I will perch on a fancy patio chair and prop up my feet and sip a clean and delicious green juice, letting the day wash over me. For users’ safety, the shower valve will allow temperatures between 60 and 120 degrees. As they change the water temperature, the color of the screen will evolve from light blue, dark blue, purple, orange and red indicating the system is warming up or cooling down to reach the desired water temperature. When the shower is ready, the screen will turn white and provide an on-screen notification and signal with a tone. The controller itself has seven to nine buttons – depending on whether it’s a two- or four-outlet system – enabling users to accurately control their shower experience. It is debuting this week at CES in Las Vegas and I will not be there to witness it. But I should be.